JERUSALEM—In the wake of Islamic State's recent successes in Syria and Iraq, Hezbollah leader Hassan Nasrallah termed the extremist jihadi group "an existential threat." "We face a threat unparalleled in history," declared the leader of Lebanon's Shiites in an impassioned television address. He called on the Lebanese government "to abandon hesitation, neutrality, silence" and commit the Lebanese army to the struggle. Hezbollah itself has been playing a major role in the Syrian civil war during the past four years alongside the regime forces of President Bashar al-Assad. Israeli observers note that this is the third time in two weeks that Nasrallah has issued a call to arms against jihadist Sunni forces in the region, indicating mounting concern. There have been reports in recent weeks that the Syrian army has been losing traction against the Islamic State (IS). Should the Syrian army crumble and IS sweep across the country, Lebanon fears it will be its next major target. Israel Radio this week quoted a prominent Syrian journalist, a supporter of the Assad regime, as saying that Syrian authorities have decided to give up the fight for rural areas, the bulk of the country's territory, and to pull its forces in to protect the cities where most of the population lives. Attempting to refute the Islamic State’s image as a virtually invincible tide, Nassrallah said reality was different. "They aren't stronger than Israel or the U.S. and the nations of the region have defeated both," he said. He dismissed the coalition strikes against IS as ineffectual. "The number of air strikes they carried out in a few months is smaller than what Israel carried out against Hezbollah and Hamas in a much shorter period," he said. Nor was hope to be placed in a joint Arab force, he said. "The only option is to rely on ourselves and on the peoples of Syria and Lebanon." Nasrallah also reminded his listeners that Israel remains Hezbollah's principal enemy. "We have not abandoned that front and will not." In fact, Hezbollah is too involved in Syria to devote much attention to Israel. Lebanese newspapers report that the organization has deployed large forces along the border with Syria to block IS incursions and to dig a system of tunnels similar to that of Hamas in Gaza at vulnerable border points. 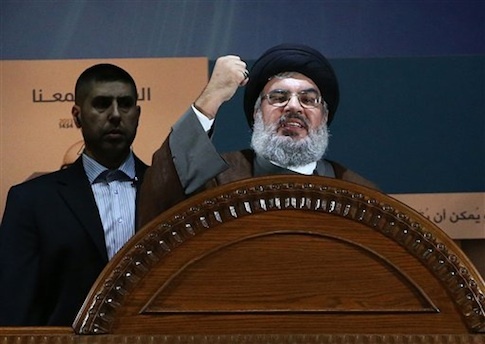 Despite Nasrallah's virulent anti Israel stance, there have been suggestions in Lebanon in recent months that in an Armageddon-like confrontation with IS there would be room to consider a joint Hezbollah-Israel effort against the jihadists. This entry was posted in National Security and tagged Hezbollah, Islamic State, Lebanon, Syria. Bookmark the permalink.